There is a famous saying in philosophy which states: “Epistemology precedes metaphysics.” Epistemology, “the study or a theory of the nature and grounds of knowledge especially with reference to its limits and validity,” (Webster’s Seventh New Collegiate Dictionary, 1970, p. 280), must necessarily precede metaphysics, which concerns itself with the nature of being and existence. In short, what we know is a function of how we know what we know. Just as we have a level of analysis to study the neurophysiology of the brain, and a cognitive-behavioral level of analysis to study human cognition and behavior, we need a noetic level of analysis (the Greek word for mind is nous) to study those subjective aspects of the brain typically called the mind. If we are going to make any significant headway in better understanding the mind and its relationship to consciousness and the brain, we need a comprehensive quantitative phenomenology to scientifically investigate the mind. This was echoed over a decade ago: “A growing number of cognitive scientists now recognize the need to make systematic use of introspective phenomenological reports in studying the brain basis of consciousness” (Lutz & Thompson, 2003, p. 31). Subsequently, Zelazo, Moscovitch, and Thompson (2007) wrote: “There is also the growing realization, however, that it will not be possible to make serious headway in understanding consciousness without confronting the issue of how to acquire more precise descriptive first-person reports about subjective experience” (p. 2). Neglecting the mind in favor of only neurophysiological or cognitive-behavioral data about the brain is like looking for your car keys under the lamp light because this is easier, even though you lost your keys in the dark, far away from that lamp post. The mind can be quantified, as can quarks, the economy, or a neutron star: precise descriptive first-person reports about subjective experience can be obtained in a reliable and valid manner. Physics became queen of the natural sciences because it wedded mathematics to the description of natural phenomena. By measuring and quantifying the world around us, we have learned how to predict, and, sometimes control, that world. This model from physics has since been applied to chemistry, cosmology, and the various social sciences with great success. By quantifying a phenomenon of interest, we then use mathematical tools and models to better predict and control our universe. The same model can be applied to the mind. The use of a quantitative, phenomenological analysis, or noetic analysis, is distinguished from the descriptive, non-quantitative phenomenological analyses of the psychological phenomenologists (Giorgi, 2009; Moustakas, 1994) and also neurophenomenology (Lutz, 2002; Varela, 1996). 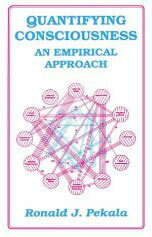 Previous writings by the undersigned (Pekala, 1980, 1985a, 1991b, 2002) have also described this empirical, phenomenological approach as a psychophenomenological approach to introspection or phenomenological observation. The term, noetic analysis, was chosen to further highlight and differentiate this quantitative approach to assessing, and quantifying, the mind and states of consciousness from that of philosophical phenomenology, the phenomenological psychologists, and neurophenomenology. Noetic analysis is involved in quantifying and statistically analyzing the processes and contents of subjective consciousness: the mind. Noetic analysis seeks to go beyond descriptive philosophical phenomenology, attempting to quantify the contents and processes of consciousness, in some sense paralleling Husserl’s (1931/1972) noema/noesis doctrine, i.e., “the traits of the object intended (noema) and the traits of the conscious intending (noesis)” (Ricoeur, 1967, p. 21). The approach allows for the statistical analysis of the processes and contents of subjective consciousness, or the mind, and their mapping onto psychological, neurophysiological, and individual differences factors. Phenomenological psychology, as espoused by phenomenological psychologists, such as Giorgi (2009) and Moustakas (1994), does not quantify the processes and contents of consciousness in such a way as to make the approach statistically useful in correlating such processes with the brain, human behavior, and individual differences factors (although their approaches do furnish us with very rich, descriptive data about the mind). Such trained introspection, as was used in classical introspectionism over 100 years ago, resulted in different laboratories “training” introspectionists in different ways: “laboratory atmosphere crept into the descriptions, and it was not possible to verify, from one laboratory to another, the introspective account of the consciousness of action, feeling, choice, and judgment” (Boring, 1953, p. 174). In contrast, noetic analysis uses “untrained” introspectionists, i.e., individuals with no specific training in introspection (such training is not needed since individuals retrospectively rate their subjective experience via standardized questionnaires). In summary, the noetic approach described herein uses standardized self-report questionnaires that measure dimensions of subjective experience (such as imagery, absorption, volitional control, positive affect) in a reliable and valid manner, allowing the processes and contents of the mind of the client/participant to be quantified. To do this, participants retrospectively rate the items of such questionnaires in reference to a preceding short stimulus condition; thus, the act of introspection is not reactively influencing their stream of consciousness, as might be the case with concurrent observation. The methodology involves the retrospective completion of a paper-and-pencil questionnaire that is completed in reference to an immediately preceding stimulus condition. Questionnaires, such as the PCI (Phenomenology of Consciousness Inventory, Pekala, 1982/1991), and the DAQ (Dimensions of Attention Questionnaire, Pekala, 1985/1991) are used to assess and quantify various aspects of subjective experience. Whereas the PCI maps subjective consciousness in general, the DAQ maps subjective attention in particular. Quantifying Consciousness (1991) goes into detail about the methodological and statistical limits for using RPA and the interested reader is referred there for details concerning this approach. (A)cross groups of randomly selected individuals, the same behaviors in the same stimulus settings (the same stimulus conditions) will be associated with the same intensities and patterns of phenomenological experience (the same phenomenological state), while different stimulus conditions will be associated with different intensities and/or patterns of phenomenological experience (Pekala & Wenger, 1983, p. 255). Since this principle posits a correspondence between subjective events and overt behaviors across groups of individuals in particular stimulus settings, it permits the intensity and/or patterns of phenomenological experience associated with similar and dissimilar conditions to be compared with one another (Pekala, 1991, p. 86). By grounding phenomenological experience to specific, repeatable and accessible stimulus conditions, and the testing of such conditions across groups of randomly selected individuals, I believe we have a rigorous methodology to tackle the problem of quantifying subjective consciousness (the mind) and how that subjective experience relates to human behavior and its associated neuropsychophysiology. Over the past three and a half decades we have generated research to support that position. We have found that the PCI and predecessor inventories to be reliable and valid for mapping phenomenological experience in response to such stimulus conditions as eyes open and closed sitting quietly, hypnotism, progressive relaxation, breathing techniques, drumming and trance postures, and even fire-walking (Forbes & Pekala, 1993, 1996; Maurer, Kumar, Woodside, & Pekala, 1997; Pekala, 1991, 1995a, 1995b; Pekala & Levine, 1981, 1982; Pekala & Wenger, 1983; Pekala, Steinberg, & Kumar, 1985; Pekala & Ersek, 1992/93; Woodside, Kumar, & Pekala, 1997). Other researchers have begun to expand that research in reference to other stimulus conditions (other than hypnotism) including: meditation (Venkatesh, Raju, Shivani, Tompkins, & Meti, 1997), shamanistic trances (Rock, Wilson, Johnston, & Levesque, 2008), religious/spiritual narratives (Wildman & McNamara, 2010), a virtual reality environment (Huang, Himle, & Alsip, 2000), partial epileptic seizures (Johanson, Valli, Revonsuo, Chaplin, & Wedlund, 2008), the neurophenomenology of oscillatory respiratory activation (Piarulli et al., 2018), and psi phenomena (Rock & Storm, 2010), among other areas. Besides mapping and quantifying the subjective side of consciousness, graphing devices have been developed to visually depict the patterns and intensities of subjective consciousness associated with this approach. Three such devices, psygrams, pips, and radar graphs are used to visually illustrate this subjective, noetic side of consciousness. The top of the home page of this website is a collage of psygrams, “graphs of the psychophenomenological state of consciousness of a group of individuals (which) allow for the state of consciousness of a group of individuals to be depicted in terms of pattern (and intensity) parameters” (Pekala, 1991, p. 86). Pips (phenomenological intensity profiles), which are also generated from the PCI-HAP EXCEL program (see below), are available to generate a graph of the various (sub)dimensions intensity scores of an individual or group of individuals and allow for that profile to be visually depicted. Radar graphs allow for the intensity values of consciousness, as quantified by the PCI, to be visually depicted across a variety of stimulus conditions for an individual or a group of individuals. 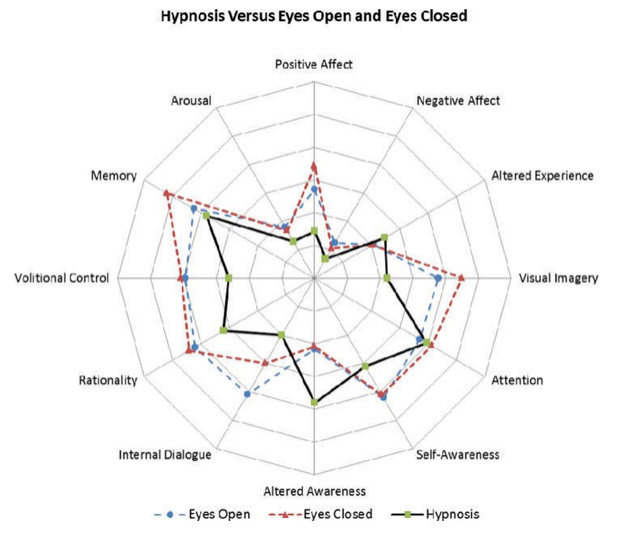 The figure below shows a “radar graph” for the intensity scores for the 12 major PCI dimensions as a function of 3 stimulus conditions—hypnosis (n = 173), with eyes open (n = 110) and eyes closed (n = 173)—sitting quietly, as reported in Pekala et al. (1986). Intensity values are typically coded as follows: center of graph = 0 = intensity effects of “none of little”; circumference = 6 = intensity effects of “much or complete.” Significance levels can also be coded onto the graph. This format allows the reader to visually compare PCI intensity effects associated with differing states of consciousness/stimulus conditions.